WE'RE OFF TO SEE THE WIZARD. Uhm, that's not quite how the song goes. :1 Heh. O,o Oopsie. So, faeries, it looks like I'm back again for the second post this week! A couple of weeks ago, maybe longer or shorter, I don't really now. Ahem! I mean, a while ago! I got an idea for a drawing. Kinda of a joke drawing. So I guess it would be a comic, but it's not really that, either. I guess you'll have to decide for yourselves if its a comic or not. 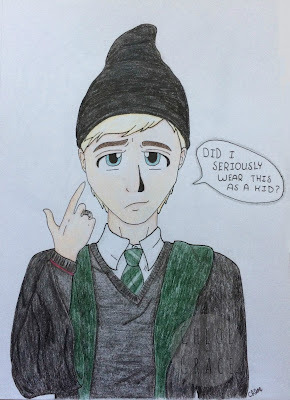 I've seen couple pictures of Draco in the first Harry Potter movies where he is wearing this strange little toque... He, like, wears it on the top of head so its barely staying there and it's really long, so it goes to a point at the end, which sticks up in the air. Now, you might be thinking, "Oh, I know what kind of hat that is, Chloe! That's easy to tell! It's a wizard hat. 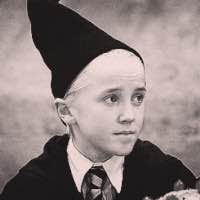 Like, dur, Draco is a wizard so it makes sense if he wore a wizard hat!" I think I've basically memorized Draco's outfit by now (or at least, one of his outfits :P). what is up with that hat?!! That hat looks.. stupid... XDDD WEIRD PONTY HATS! :D BUT AHH YOUR ART IS AMAZING AS USUAL!